Status : Unknown, possible ally. 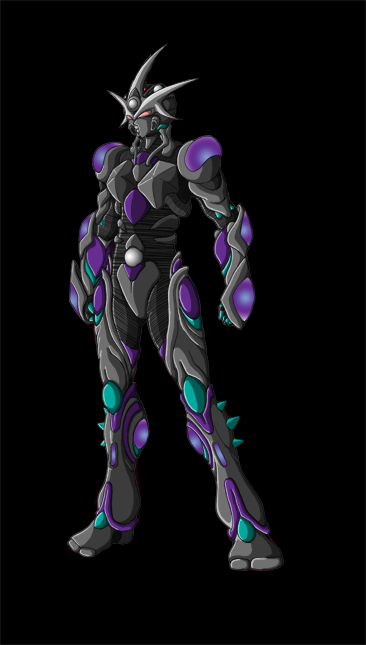 Description: Subjects is a hybrid alien/human Guyver. The unit itself is far more than a mystery. From what little evidence we have gathered the unit seems to be a brand new type, employing the most modern and advanced Gen technology. 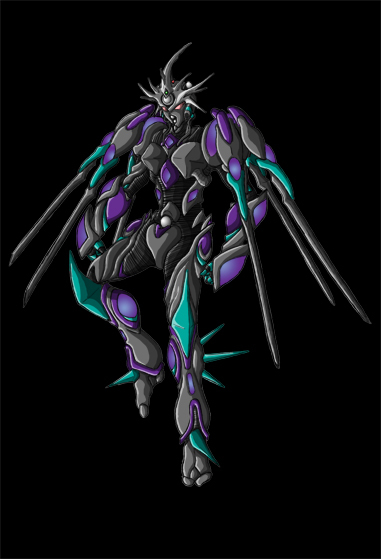 The Unit is suspected to be another test unit like the other Guyver Mercenaries units, however the Gen themselves seem to have no knowledge of its existence. The unit has considerable power, and has unfortunately caused severe memory loss within the host, and it has even warped her genetic structure somewhat. Now having achieved its ultimate form, though still very mysterious, Angel’s unit has finally shown its true power. Because the unit had to modify the host to bond with it, it accidently created two forms. Her full powered form is nearly 2.5x stronger than her other and shows more of the units incredible technology. Now that the unit has reached its full power, Angel has reluctantly shown herself to be one of the greatest assets to the cause of the human resistance. -Physical strength is enhanced to levels of near 2,300 men. Angel seems to be capable of the same form of martial training and combat effectiveness as a Kavzar, equivalent to centuries of training and experience with their form of martial art rendering her hand to hand combat a superb level. -Durability is enhanced with body shaped shield, giving the subject the ability to withstand near a 2 kiloton explosion, this can be doubled in one direction by shifting the body shield as well as external gigantic omni-directional and gravity shields to withstand a 8 kiloton explosion. If need be the subject can force all energy into one direction, backing it with her electro-magnetic shield to take on a 25 kiloton explosion. Subject is also capable of emitting a powerful shield derived from her units backside energy emissions to withstand nearly 100 kilotons of power, but requires her focus for a few critical seconds before being capable of utilizing it. Subjects healing ratio is relative to 50X a normal Guyver, and can temporarily boost her healing 4X its standard level by utilizing her electromagnetic energy field matrix to stimulate healing. Subject has shown the ability to repair damage to her control medal relatively as quick as a Warrior Guyver type, giving her the ability to take incredible amounts of damage and still battle. Subject has a shock absorbing liquid gel like substance flowing within all of her armour, offsetting physical damage taken by 80%. She has Kavzar like endurance and stamina, and, combined with her power level, makes her one of the most difficult opponents to keep down. -Hyper Sensors are of an enhanced nature, complimenting both standard hyper sensory uses, but boosting the hosts natural senses, allowing actual sight, hearing, and smell of a distance of up to 10 miles. Subject also has extended detection capabilities of energy, allowing her to detect energy build-ups, high energy spots or such, allowing her to find a specific target across vast distances of over 100 miles. Unconfirmed reports state the subject has a 6th sense while in human form, allowing her to detect shifts in local energy levels. As such this ability would give her the capability to detect cloaked enemies with ease. -Subject does not have the standard pair of Sonic Emitters, rather subject has an approximately operational pair of electromagnetic pulse emitters. These pulses are more deadly to technology rather than organics. A single blast from these can cause an EMP to spread over 3 miles, which would disable and ruin all electronic equipment within the area. Organic targets are not effected as much, however it is still strong enough in her full powered form to seriously injure any target not bio boosted. In her full powered form, Angel can target specific targets like sonic emitters and hit them with a fairly accurate targeting system with a range of approximately 1,000 feet. -Speed levels: Run=0 to 7,500 MPH / Fly=0-39,000 MPH. Both speeds can be boosted temporarily twice the norm by using electromagnetic energy in the gravity orb. Subject can also use her electromagnetic power to accelerate herself through the Earths electromagnetic field, to reach flight speeds of up to near light speed. Reflex speed has been estimated to be 200 to 1,000 times that of a normal human. -Palm infrared laser orbs power output approximates 150X the normal output for a head laser and is used in a pulse manner, giving 220X pulses every 1/3 second. Subject can combine this with her head laser orb to produce a series of powerful laser discharges that flare out in spiral patterns and together have the same damage ratio as a standard Guyvers full mega smasher. -Subject does not use the normal Vibrational blades found in Guyver units, nor the Plasma type used by Aceaer. Subjects forearms are highly resistant to vibrational material, allowing her to block blades even more powerful than the Warrior Guyvers. Subject can however emit a blade like weapon from her forearms that is as versatile as a polymorphic blade, and, due to the energy nature of the weapon, cannot be blocked by none energy based blades. It slices due to intense heat with three times the effective range as a Warrior Guyvers blades. These Energy blades can be fired as well for an effective range of 1 mile and at speeds equal to 2,500 MPH. -Units Mega-Smashers are approximately equal to a 12 kiloton attack per cell, or 24X the power of a normal Guyvers full Mega Smashers. Beam can be charged to double normal output when infused with subjects electromagnetic energy. Weapon takes the same amount of time to charge as a normal Guyver. The beam is able to be controlled mentally, allowing it to track a target even if they dodge the beam. If fired in a highly electromagnetically charged environment the weapons have shown to have a 20% increase in total power. -Flare Cannon: Subject is capable of generating microwaves at extremely high intensity by utilizing her electro-magnetic energy field matrix. This weapon, when released, is capable of literally melting the target in a surge of heat. When released, this weapon appears to emanate from the subjects body as a burning energy weapon, and when strikes can cause damage near 30X the power of a standard Guyver Pressure Cannon. When combined with subjectsgravity orb, the weapons strength can increase to near the power of a Gigantic Guyvers full double hyper smash which can be fired by both hands in different trajectories for a 50% decrease in output. Angel has shown the capability of firing this weapon extremely quickly at standard power, nearing twice the speed of a zoalords gravity bullet attack, or holding off the energy much like a Gigantic Guyver to fire a weapon of nearly a six kiloton ratio. -Gravitational powers are similar to a Master Zoalord’s but are enhanced by subjects power level and electro-magnetic energy field matrix. Subject also seems to possess multiple extra gravity control devices on her stomach area. Subjects gravity orb has shown the capability of mimicking zoalord gravitational attacks as well as forming Pressure Cannons with over 35X the power of a standard Guyvers. The Pressure Cannons can be formed into different shapes, resulting in blade or saw like gravity weapons capable of tearing through targets. Pressure Cannons can target and follow the opponent, as well as stop and be used as Proximity Bomb like weapons. Pressure Cannons also have a hint of electromagnetic energy dispersion upon contact, which causes secondary burn damage as well as frying electronic systems within the perimeter. -Subjects control medal is similar to the standard Guyver, however it is enhanced to high levels and has processing power equal to the standard Warrior type pyramid. The Control Medal also consists of an Enforcer Kavzar level crystal, and other such newly developed technologies, giving it the level of processing despite the lack of 4 separate processors. Other information about subject C-Medal is unknown, however, due to subjects ever-changing state, the medal still may be hiding most of its secrets. -Electromagnetic Weapons Matrix: A weapon similar to the weapons module on the Enforcer Kavzar, this weapon uses electromagnetic energy in place of the Enforcers weapons. This allows Angel to create nearly any electromagnetic energy based weapon she chooses, at will. This can range from electromagnetic swords, able to cut through even the Warrior Guyvers polymorphic vibrational swords, to highly focused energy blasts of varying effect. -Subject uses a combination of methods for energy handling, including a dual HSL system giving subject a constant stream of energy, plus another to feed its weaponry. Subject also uses cold fusion technology to absorb the earths natural electromagnetic field as a power source, giving the host over three fold limitless energy. The subject can also use the electro-magnetic absorbing qualities of her unit as weaponry, allowing all forms of electric attack including weather control, metal manipulation, and other forms of electro-magnetic abilities. It is possible, but unconfirmed, that subject may have the ability to control machines using this ability as well. This quality has also been said to allow her to raise her strength and other factors by a total of 50%, adding the effect of electric attack to all enhanced abilities through this way. -Electro-magnetic Energy Field Matrix: The unit’s primary energy source is always replenishing itself on the atmosphere of the planet, as well as the vast sources of electronics in the immediate area. Electromagnetic Energy feeds this alien unit as bio energy feeds units on earth, and considering that electromagnetic energy is so easily abundant and replenishing in nature, the subject rarely is ever low on power. Backed by two HSL’s, both of which supplement this energy, the unit should never feel the loss of energy. The subjects human form is said to be the source of the electro-magnetic energy field matrix, not the unit. -Ultimate Attack: Nicknamed ‘Armageddon’, subject has the ability to fire a powerful, anti-proton based, particle beam blast of varying power. Linked to the subjects naturally occurring electro-magnetic energy field matrix, this weapon delivers nearly all of its destructive power upon a single target. Exactly how powerful this weapon is has yet to be discovered. -Subject has the ability to teleport, however the host is not inclined to use it as a means of normal travel. Unit has various methods of stealth travel as well, including the ability to turn invisible or blend with her environments. Subject has shown the ability to hide in hyperspace like the Warrior Units by automatically travelling to hyperspace when the host life is in danger, as well as use wormholes for faster than light travel. -Wing Discharge: Angel has four small ports on her back that emit a strong emission of magnetically charged plasma. Due to units high energy intake, it must expend useless material much faster than other Guyvers who breathe such waste through their breathing ports. This discharge also acts as a form of weapon, as it is extremely electrified and being made of plasma, can be extremely deadly when used in melee combat. The wings are composed of an extremely thin material that is over three and a half foot in length and glows due to the residue on it. When subject is in high energy modes the wings immediately flare out of her back at the appropriate length. The maximum length witnessed was well over 9 feet per wing and were deadly against most attackers. -Subject has also received a form of instinctual programmed knowledge of many different subjects which include: Gen type martial arts taught only to Gen warrior casts, knowledge of much of the Gen structure, history, and actions. A variety of languages including ancient earth tongue, various languages spoken in the Gen systenms, as well as a few of earths languages. -Unconfirmed reports state that the unit itself is still adapting to the host, trying to reach full power. If true, we may have yet to see the full potential of this Guyvers technology. -Further reports state the subject has shown the capability to use her electro-magnetic powers even in human form. Such she has been viewed to move metallic objects without physical contact, jump extremely high and long distances, as well as touch or strike people or objects and cause 2nd degree burns. Other strange occurrences is the inability to be photographed or filmed, the ability to magnetize local metallic objects, stop watches, destroy equipment simply by walking by, and cause very strange results in tests. A more comprehensive report on subjects powers in human form will be done at a later time.